Josie lives in New York, happily ensconced in a small apartment, with her partner Caleb. They’ve been all around the world together, and definitely love each other, but Josie hasn’t told him about her murdered father, her cultist mother or her crazy twin sister. When a podcast called Reconsidered: The Chuck Buhrman Murder starts becoming the newest thing, Josie realizes that she has to tell Caleb that she’s not an only child and that her parents weren’t both dead–and then she finds out her mother just committed suicide. Going home again is rough, but Josie has her Aunt A (her mother’s sister) and Ellen (her cousin) to help her through the memorial and the funeral. She also is tempted to listen to the podcast. When her sister, Lainie, shows up, Josie doesn’t know what to do. Lainie’s always been the bad twin–after all it was an action of Lainie’s that made Josie leave all those years ago. When Lainie introduces her husband, Adam, and their child Ann, Josie has more reason to think Lainie is trying to ruin her life–Adam was her boyfriend first and Ann was the name of their imagined child. As questions pile up, Josie questions the only witness account leading to the murderer being arrested–Lainie’s account. And then Caleb shows up to help her through the time, and to hear how Josie has ‘protected’ him from the truth. I really loved reading this book, a lot more than I thought I would. While things like Serial have stunned the nation, I felt like Barber ripped something from the headlines, but did so in a good way. However, I also feel like the characters could have been a little more developed. I figured out a huge plot point early on, as I read a lot of mystery, and it ruined the reveal to me. I felt like the podcast portions were solid, most of the interactions were believeable, but I felt like this could have had 50 or so more pages of content to be fully complete. 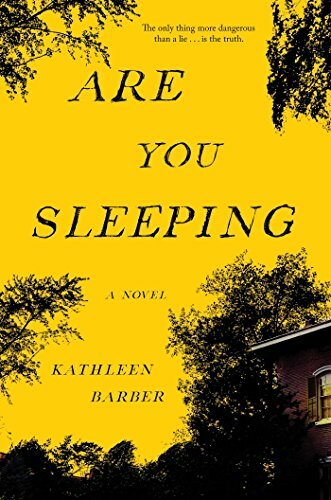 I definitely think this is a thriller that needs to be considered for anyone who might be interested in the genre–it’s timely and could very well lead me to enjoy more works by Barber (this is her first book!). I had a slight break (read: nap) while reading it, and kept thinking about it. So it is definitely compelling. I just wanted more.